New! Martinique by 3 Sisters for Moda. Now in! 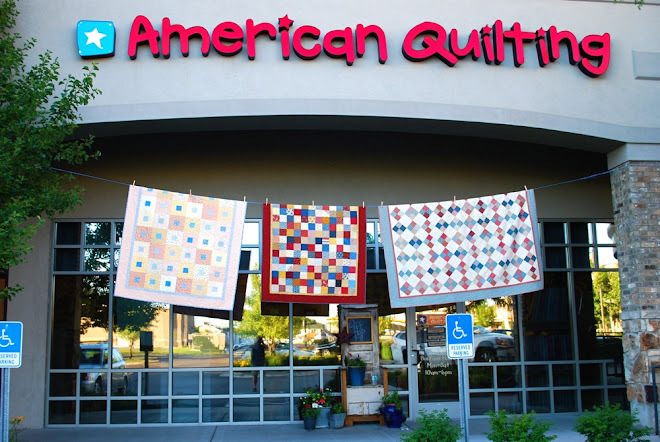 Some upcoming events at American Quilting! This Friday (April 23) is Fat Quarter Friday for this month. All pre-cut Fat Quarters are only 6 for $11 this day only. We've got lots of new fabric in the store right now - many new lines from Moda. We will have our new class list for Summer available at the shop on May 1. We are no longer doing mailers, so come in a pick one up. We have started an email list for announcements and extra coupons. Sign-up your email address at American-Quilting.com to get these offers and discounts. Also starting May 1 we will be taking sign-ups for our new Block of the Month that starts the second Saturday of July and continues on the second Saturday of every month until the following June. This is our seventh year of doing this and Amy's quilts never cease to amaze. Call the store (801) 802-7841 for more information! Can we sign up for the class over the phone? I am in Salt Lake but it's totally worth coming down once a month if I can actually make it in this year. I didn't find out about signups in time last year. I'll see you Friday! I love all your new fabric! Love the new Moda line, that red is wonderful along with the softer pinks and whites! WOW.